I wouldn't say I have A LOT of books, because over the years I've grown lazy/too busy to read & prior to that I went to the library most of the time! But still, I did buy some of my books of course. And... another small stack here. I'm not sure if you can tell what type of genre I like from all these book titles, but I guess I'd say I like thrillers (murders), fantasy (magic/post-apocalyptic world) & humour. I don't like romance while chick flicks are passable if they involve one of the above 3 genres haha. 1) take up space & 2) are a total waste of paper! I mean just think of all the books that are printed to be read once & chucked aside? At most, you re-read them maybe... 3 times over the span of... 5 years? That's already assuming you like the book a fair bit. For some books I buy them, read them & never want to go through them again. Furthermore, with our busy schedules sometimes the best time to read a book is on-the-go, in between appointments when we have time to kill, on public transport... etc. But it can be quite troublesome to lug a book around in your bag when you may not have time to read it that day. On the other hand, most of us DO carry around our tablets or phones around with us every single day, everywhere! Even if you don't own a tablet, I'm sure most of us use an iPhone or Android phone. Which is why... it would be ideal to have our books on these devices! 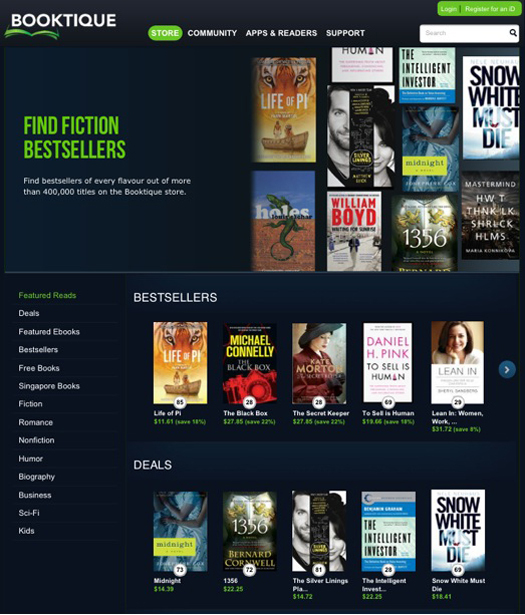 Booktique is a new ebook store with a large catalogue of books, ranging from international bestsellers to local literature. 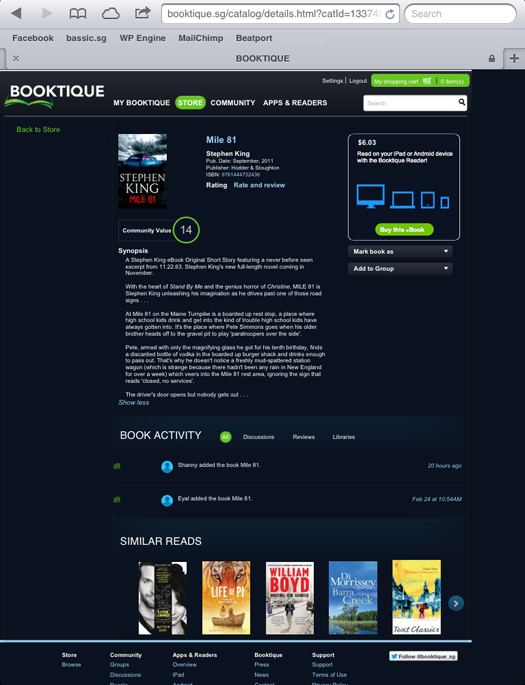 With Booktique, reading is made social as you can join a large community of readers to discuss, share notes & reviews! 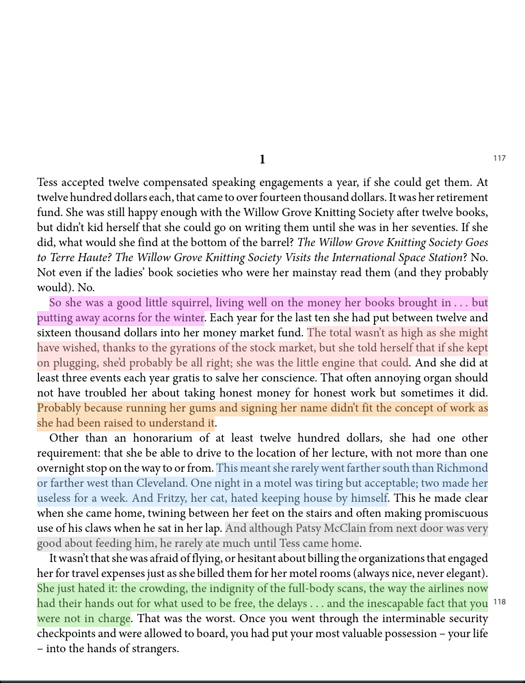 Booktique also has many in-book annotation tools (I'll show them later). While your reading progresses, your library is also synchronized across all the devices you have, so you can access your books anytime on any of your various devices (I'm sure you at least have an iPhone/Android with you)! To get your ebooks, go to Booktique & make your selection online! After selecting & paying online, you can download it to your devices. 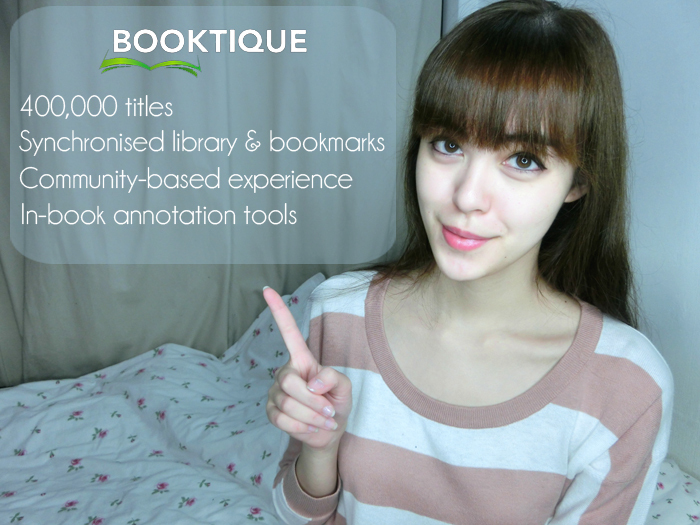 Here's how Booktique sorts some of the titles they have! 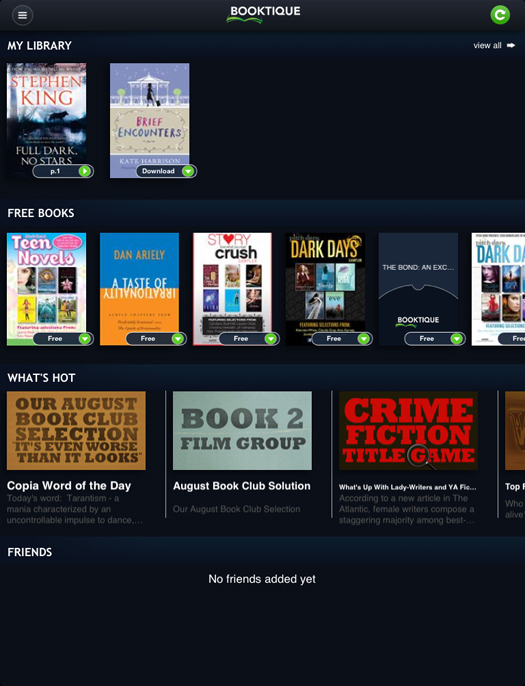 These features are kept updated so you can expect new books & deals to be showcased each time. Prices of the ebooks are also very reasonable, especially if they're on sale that day! Decided to take a look at the Stephen King book, since it costs only $6.03! On the book's page you can see the community value, reviews, discussions & other activities! And of course the description of the book as well. 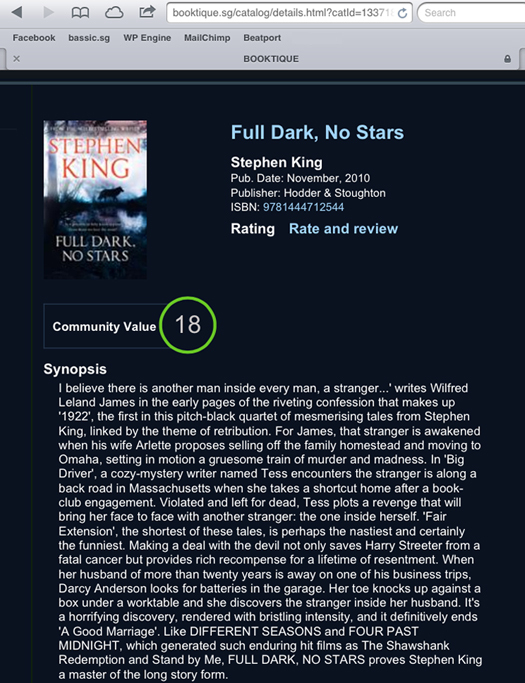 The Community Value is a rating that Booktique calculates based on several factors, such as readers’ ratings, number of reviews & number of library additions & book discussions. 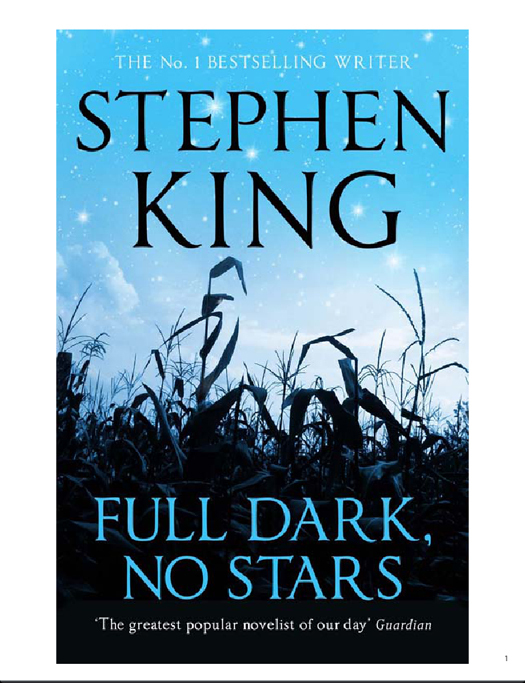 From this Stephen King ebook I decided to take a look at ALL available Stephen King titles by clicking the author's name. I settled on this one instead & decided to purchase it! Decided to buy this book! Purchase is super easy as I have a StarHub Hub iD. If you do not have a Hub iD or Gee! 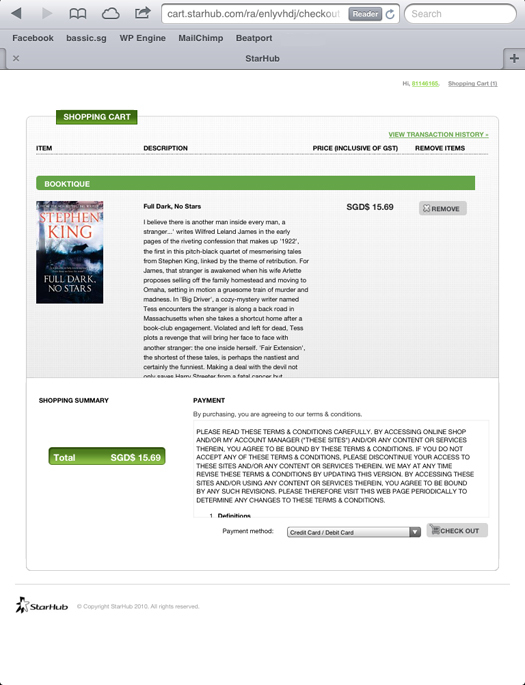 iD, you can sign up pretty easily on Booktique. Simply click on the “Register for an iD” tab on the homepage & follow the signing up process! If you are a StarHub Mobile customer, you can charge your ebook purchases to your monthly mobile bill! 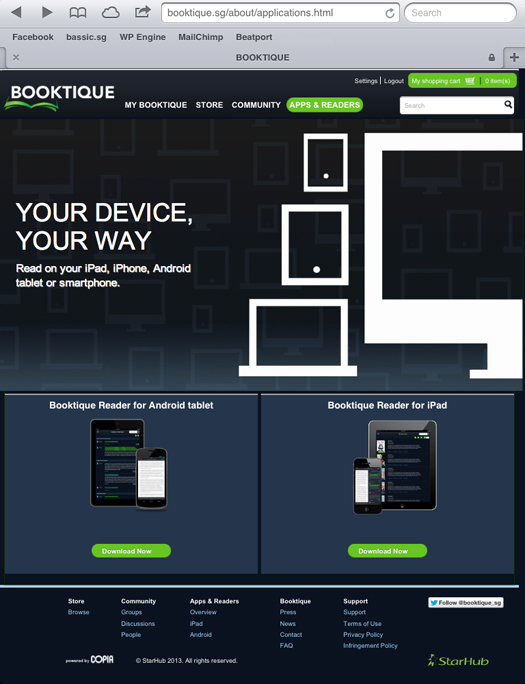 Download the Booktique Reader to be able to start reading on your devices! Similar layout as online! As you can see, from my library I can download the books I have purchased online & access them anytime I like. Ahem... the "Brief Encounters" was a free book so I was just testing it out... I don't like romance ok! The text is super sharp & clear! And here's how the page flip looks like! Simply tap to flip! It took me a lot of tries to get this shot timed exactly to capture the flip ok; hence I look a little distracted haha. It's really convenient to be able to read the books on a tablet! Tap to bring up the menu! 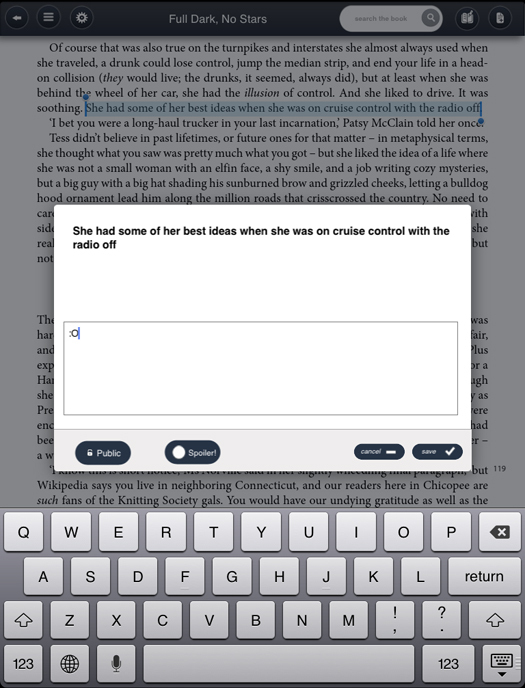 Here you can easily see your reading progress & quickly jump to any page just by dragging! 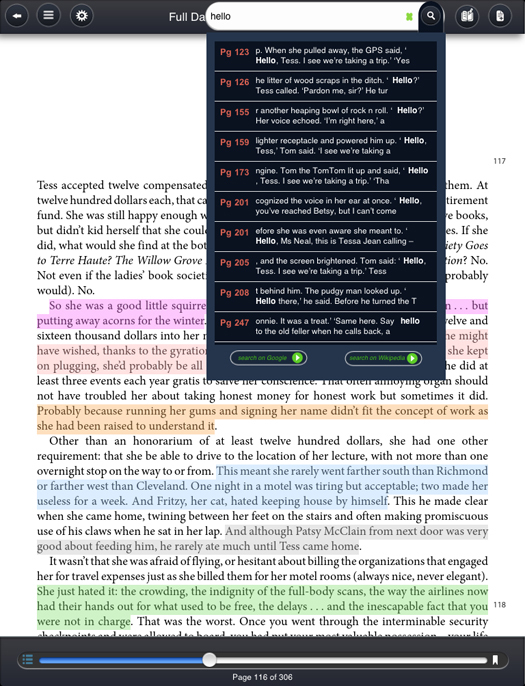 And here, take a look at all the possible in-book annotation tools! So you can Note, Highlight, Define & Search your selection! Crazy number of highlighter colors! And so many pretty pastels! For the boys/less girly ones, there are of course many more normal/neutral colours haha. Like the grey that I've included above. I think this is pretty impressive! Unsure of the meaning of a word? Simply highlight it & get it defined! It actually provides a really comprehensive definition. You can search either by highlighting the desire text/word, or by entering it directly in the search box! Here you can make personal notes about the text! It can be anything! Although it should probably be something deeper than my ":O" hahaha. You can then share these note(s) with the Booktique community, making them public! 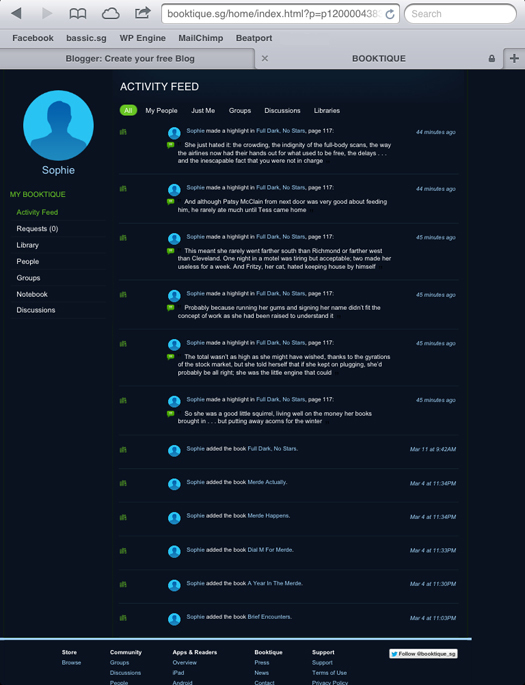 Here is an example of my activity feed! You can add friends on Booktique! Here's the ebook text with the highlights! 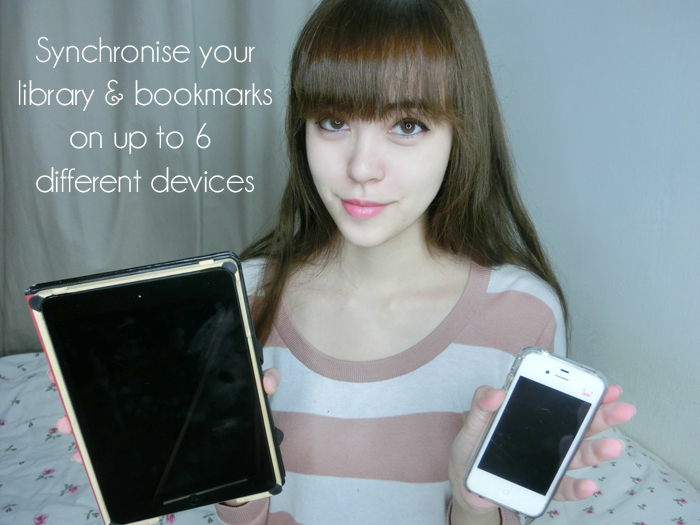 And the best part is that you can synchronize your reading progress on up to 6 devices! But it would definitely be useful if say you want to access your account on someone else's devices! Like maybe you & your boyfriend decide to share his iPad for an overseas trip? Something like that haha. Whatever it is, Booktique gives you the flexibility to decide how you want to spread it out. Reading on the tablet is much more convenient than physical books! Imagine you're going for a long holiday? Or you're almost done with your current book, but the route to school takes 1.5hours & lugging out a 2nd book is really silly? Or you're reading Book A currently, but you suddenly feel like reading Book B instead, or want to check something in Book C? Or especially if you're following a guide (like a cookbook or other self-help guide), you want to be able to access the information easily without having to bring the book with you everywhere you go? There are so many benefits to being able to access a whole library of books on-the-go! Also, a tablet would probably be much lighter & less cumbersome than carrying a book out! You also wouldn't have to debate that day about whether to bring out your device or not, because odds are you use it for many other purposes like surfing the Internet or school/work, especially if it's your phone. Whereas a book... can only be used as a book. Lol. Ebooks are really the future of reading! I feel quite sad when I think about how little I read nowadays compared to my younger self & I think many of my peers read even less than I do (like, I hear some have not read at all since... secondary school). And I worry for our future generations O.O NO ONE PICKS UP A PHYSICAL BOOK ANYMORE! Everything has to be digital! But hopefully with ebooks reading will be made so much more convenient so I'll really have no excuse! Whenever I have a few minutes I can easily browse through the latest titles & see what's in store, whereas the odds of me having the time to go to a bookstore or to happen to be at one are much smaller & less frequent. And with ebooks I can easily switch from e.g surfing the Internet to reading without having to be thinking like, Oh no I feel like reading but I didn't bring my book or I should try to read today therefore I will bring out this book & hope I have time for it in the day. And look at the thickness of an iPad... that can hold tons of books. For a limited time only, get a FREE ebook from Booktique! Simply SMS SOPHIE<space>Book Number<space>Name<space>Email to 90245851! After receiving the coupon code, login to Booktique & enter the code to have it added to your library! Hurry, because the promotion ends 24 April 2013 & it's on a first-come, first-served! 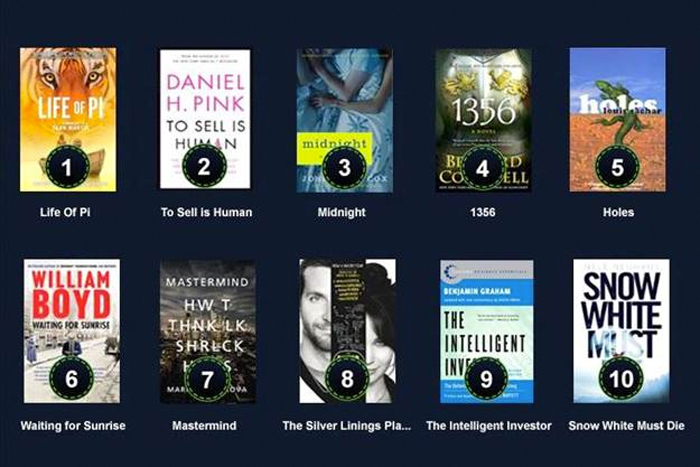 Quickly SMS in to redeem your first ebook for FREE & then you can slowly browse through the many, many (400,000+ & counting) other titles available to make your pick for your next read! You'll also be able to find other like-minded people who may share your interests for a particular genre or author or character or plot twist/mystery, thanks to the Booktique community where you can share your reviews & selections with your friends & other users! There you can also get recommendations so you have a better idea whether you will like the book you're considering! No more excuses to procrastinate reading those books you've been meaning to! Sophie if i am not a Singaporean can i use this too? Thanks! You need a Singaporean IC Number to create a HubID or GeeID :/ So you'd need a Singaporean IC! Thanks for the intro to this new eBook app. Have been using skoob but titles the there are limited. BTW I have already SMS in to redeem a free book. I got the coupon number but I have no idea where to key in and redeem the free book. Someone please enlighten me. Ty! I've already converted to ebook instead of the traditional book. You're right! They take up too much space plus they gather dust. I strongly recommend reading ebooks coz its like saving trees! You're sooo pretty sophie! And finding out you like books so much makes you even prettier still!